Whether you order online or at our showroom, our goal is 100% customer satisfaction. Our experienced designers are very efficient and our turnaround time will impress you. Get more for your wedding! Don't forget to mention ChossonKallah.com when visiting Print Mall. Print Mall is offering free custom monograms at $100 value amongst other special offers. You can choose from hundreds of monograms beautifully displayed on our website. 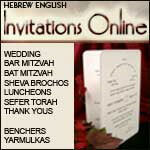 Visit our website or call us at 1-888- SIMCHOS for more information.